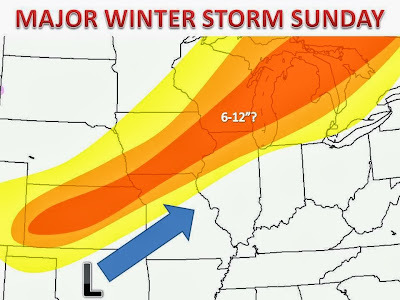 It has been a weather computer model battle for the past several days now, as to what and where would strike the Midwest this weekend. Well, the GFS and EURO models (European and American) have settled their argument and are agreeing on a possible solution. They are showing a band of heavy snow (winter storm warning criteria) from Nebraska all the way into Cananda. The map on the left shows the risk of seeing this band of likely 6"+ of snow as an area of low pressure deepens rapidly on Sunday to near 988mb, on par with a hurricane! You are going to want to stay tuned for this one, we will be providing constant updated on our site here and also on our facebook page, which you can "like" on the box on the right hand side of your screen.